We are very privileged to have such a fantastic rehearsal space at the Cheshire Academy on Broad Street (Crewe) and are always looking for ways we can support the centre in their new ventures. This summer we were very excited to have been asked to take part in the recording of a charity single written by one of the founders of the Academy after we had initially premiered the piece in 2015. 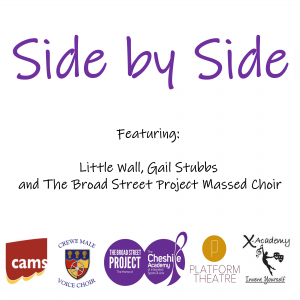 A short 3 years later and this song has been transformed to include a massed choir of 60+ people from community groups across Crewe and Cheshire and soloists Gail Stubbs and Little Wall. The single is now available on iTunes, Amazon, Google Store, YouTube Music, Spotify, Deezer and many more. All proceeds will go to the Cheshire Academy to support them to continue providing excellent services for their students and the local community. We had a great time recording it and hope you have a great time listening to it! We are very excited to unveil our new website with lots of pictures and memories and stories from the choir. Keep up to date with our news as well as features of the choir through our blog. A new blog will be posted every couple of weeks. Not enough news for you? Find us on Facebook! Crewe Male Voice Choir is at The Wesley Centre Sa.